ALBANY – SueAnn Rogers – 69, of Guilderland, NY, passed away at the Hospice of St. Peter’s Hospital on Friday, September 9, 2016. Dan (Jodi) Rogers of Folly Beach, SC, Gerard Rogers, William Rogers, and her best friend and sister Teri (John) Sorino of Troy as well as her adopted family at Lexington Center Guilderland, who loved her and gave her the best of care. She is also survived by her two Aunts, Florence Simmons and Sandra Roddy both of Scotia and several nieces and nephews. Sue was predeceased by her brother Joe Rogers in 1968. Sue lived at home with her parents for 61 years and attended the Rensselaer County ARC Brunswick Day Program. After her mom passed she moved to a Lexington Center Guilderland home where she immediately became a big part of their loving family where they will continue singing her favorite song, You Are My Sunshine, everyday!! The house will miss her great laugh, and the way she was able to cheer everyone up (including the staff) even on a bad day, with her one liners. Sue loved participating in Bowling, Arts and Crafts, and giving, receiving and just enjoying flowers of all kinds. Suzie made friends wherever she went. She was known for her big smile and outgoing personality. She always remembered a face and was quick to greet anyone who came her way. She may not have remembered your name but she would give you one that she thought best fit you! There were many Patty’s, Rose’s, Jimmy’s and even Santa’s. She loved her babydoll Chrissy, of which there were a dozen over the years (always the same name). And she loved her sister’s dog Tanner – renamed Tippy! We will forever remember the favorite punch lines that made us laugh: you snot/you like me? No. Oh yes you do. / Yea Bill / I’m 34 / it’s 9:30 / get the phone Bill / I like you! Sue was the pillar and shining star of our family. The glue that kept us together. The ever present voice of conscience (I’m telling Mommy), the willing dinner partner who would secretly eat all your vegetables for you, the guardian and protector at the playground and the giver of unconditional love. We will forever hold her in our hearts. Funeral services and private viewing will be held at Hans Funeral Home, 1088 Western Ave., Albany. Burial will be at St. Patrick’s Cemetery in Watervliet. 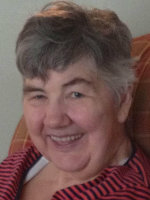 Memorial contributions in memory of SueAnn Rogers, may be made to Lexington Center Chapter of NYS ARC c/o 235 Pinewood Drive Schenectady, NY 12303. To leave a message of condolence for the family, please visit www.HansFuneralHome.com . We were so sad to hear of Sue’s passing. She will always be remembered as a loving part of the Rogers (and Costello) family who brought smiles to us all throughout her lifetime. She and the entire family are in our prayers during this difficult time. all those she knew. My deepest love and sympathy to all. To all who loved Susie, our condolences. She was indeed everything described in this lovely obituary. As her family mourns her, I think about all they did for her when she was alive, and how deserving she was. She will be remembered by all who knew her. Teri and Family, I am very sorry for your loss. You are all in my thoughts and prayers during this difficult time.